Our road trip was a success. Although we spent most of our time driving (hence the word road), we were happy to have a change of scenery. It took us awhile to get moving. It must have been the whole take-care-of-home-before-I-leave mentality. Before even setting sail, I received a surprise call from my son's grandparents. Evidently he was bored with his normal activities as a child and decided sticking an eraser in his ear would produce more entertainment. I did not freak-out. I almost couldn't believe it took him eight years to attempt something like this. Thanks to shows like ER, Grey's Anatomy, and Hawthorne for guiding his grandparents in the right direction. They were able to wiggle the eraser from his ear, just in time for everyone to yell, "DON'T DO IT AGAIN!" What's the one thing you should never do when heading out of town? Leave during rush hour. We picked the worst hour to hit the road. It made the trip a little unbearable towards the end. We made no stops, not even to use the bathroom (suddenly an image of the astronaut and a diaper appears). Luckily, we had some hot chips and soda to keep us alert. 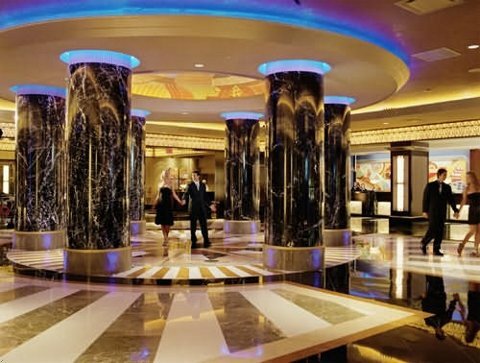 Along with forever changing the skyline of Atlantic City, the new Rendezvous Tower at Resorts has redefined the entire Resorts experience. From the moment guests approach the stunning 27-story tower and enter the impeccably designed Grand Lobby, they are surrounded by a sense of style and sophistication. The sleek art deco theme prevails throughout the Rendezvous Tower, from the hand-painted murals and marbled walkways to the stylishly decorated and spacious hallways and guest rooms. Just steps away from valet parking, the Grand Lobby, the newly expanded casino and 25 Hours lounge, the Rendezvous Tower at Resorts is the perfect choice for guests. We arrived, extremely tired. All we wanted was food, a bed, and to relieve our bladder. FYI: No cameras are allowed on the casino floor. This was shot before we entered. The casino at Resorts is opened 24/7. You can take a nap, grab a bite to eat (we ate here), and then return to the casino to try your luck. If gambling is not your forte, you can always spend time relaxing at the spa or taking a quick dip in the pool. However, if you want to make the night memorable, you should visit the hotels exclusive night club, Boogie Nights. The grooviest nightlife hotspot is at Resorts. Boogie Nights is the ultimate 70's and 80's dance club every Friday and Saturday night. Party on the second floor and relive the 70s and 80s. Boogie Nights has taken their show on the boardwalk as well. Join them every Friday from 5pm to 9pm for Boogie On The Boardwalk to participate in games and win prizes. Even better, Resorts Casino is offering a wonderful prize to those who may be visiting their casino, or the Atlantic City area. Would you like to WIN A PARTY FOR YOU AND FIVE FRIENDS AT BOOGIE NIGHTS? Follow Resorts Casino on Twitter and Youtube to keep up with the latest updates. Free Internet. Guests have to pay to access the Internet. No way! As a blogger, this is essential. Microwave. Our room had a refrigerator, but no microwave. How can I heat-up my leftovers? Smoking. It was unbearable and kept us away from the casino. Signage. We felt like we were on an obstacle course trying to find our way around. Bedding. Even when we turned the air off, it was freezing. The comforter was way too thin. Check-In. 4pm is too late for check-in. 3pm would be much better (even though we arrived late). A special "Thank You" goes to Resorts Casino and Brian Cahill for giving us a complimentary stay. Brian was nothing but accommodating and very easy to work with. Sometimes moms need a break, even if it's just a few hours away.